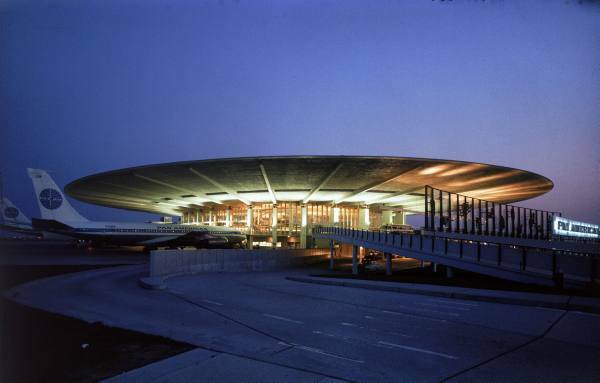 Here&apos;s a sad farewell to the once-futuristic Pan Am Terminal 3: The 53-year-old modernist beauty with an iconic flying saucer-shaped roof is being wrecked at New York&apos;s JFK Airport right now. Once known as Pan Am&apos;s Worldport Terminal, the structure is being demolished by Delta Airlines, which took over the building after Pan Am went out of business in 1991.The terminal recorded its last flight in May and demolition began last month. The Pan Am terminal was designed by the architecture firms of Tippetts-Abbett-McCarthy-Stratton, and Ives, Turano & Gardner. The four-acre overhanging roof doubled as a canopy for passengers who originally walked outdoors from the terminal to board planes. The above photo from Life magazine&apos;s searchable online archives shows the building in operation during its heyday. Eero Saarinen&apos;s swoopy and superlative TWA terminal was completed at JFK in 1962, throwing a bit of shade on the Pan Am facility. Still, the Pan Am terminal embodied the modernity, swank and outright coolness associated with early jet air travel. New York City preservationists unsuccessfully fought to save the terminal and just last month, the National Trust for Historic Places put the building on its "American&apos;s 11 Most Endangered Historic Places" list. But it was to no avail. Delta is demolishing the facility to make way for aircraft parking.